Origin and Habitat: Bolivia (Cochabamba, Chuquisaca, Formosa, Santa Cruz and Tarija), northwestern Paraguay, and northwestern Argentina (Chaco, Formosa, Jujuy and Salta). Also reported from Mato Grosso do Sul, Brasil. Altitude range: 0 to 1000 meters above sea level. Habitat and ecology: This species is found in dry and low-lying areas, sometimes associated with Pereskia sacharosa. It grows in clay soils. It is consumed by peccaries (Catagonus wagneri). Quiabentia verticillata has a wide distribution, is locally abundant, and there are no major threats affecting it. It is favoured by livestock grazing. Habitat and Ecology: This species occurs in dry and low areas, sometimes associated with Pereskia sacharosa. 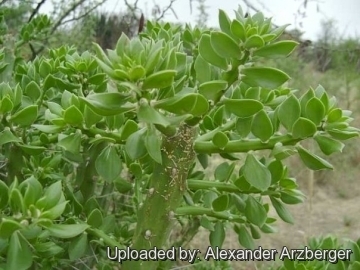 Quiabentia chacoensis var. jujuyensis Backeb. Description: Quiabentia verticillata is a treelike or shrubby plant 2 to 15 metres high with a distinct trunk. Derivation of specific name: 'verticillata' from Lat., verticillate; for the branching pattern. Stems: 1-3 cm thick branching off from the ends (verticillate). Areoles: Conspicuous with white felt and wool, somewhat persisting. Leaves: Oval to lance shaped, almost sessile, nearly cylindrical at base, 4-5 cm long, to 2 cm broad, very succulent and almost terete. 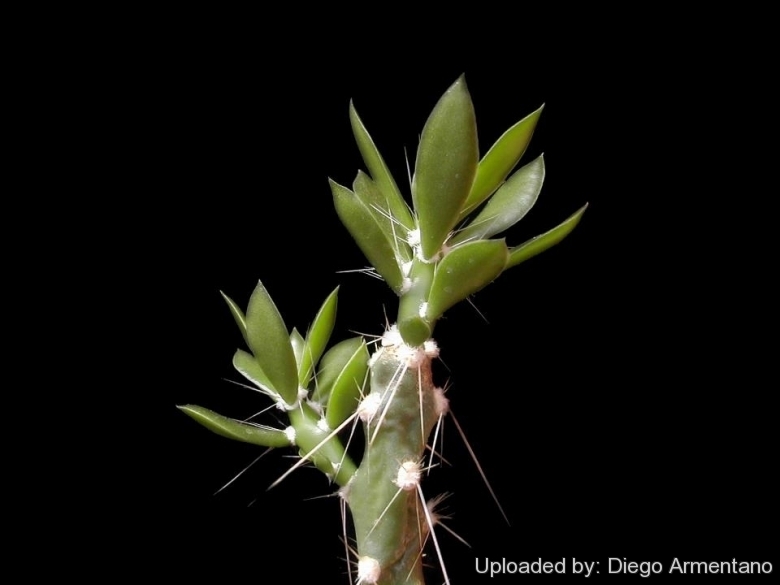 Spines: Several, acicular, white, downward pointing, of very variable length, the three longer to 7 cm long. Flowers: Pale red, 1.5 cm long. Quiabentia pflanzii (Vaupel) Vaupel ex A.Berger: A tree or shrubs, with fleshy, cylindrical stems and oval leaves rather straggly in habit, 4 to 12 (-15) m tall. Distribution: Paraguay and Bolivia. Quiabentia verticillata (Vaupel) Vaupel ex A.Berger: is a treelike or shrubby plant 2 to 15 metres high with a distinct trunk. 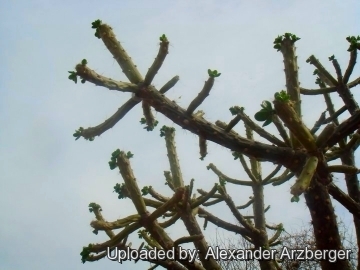 Stems branching off from the ends (verticillate). Distribution: Bolivia, Paraguay, and Argentina. 8) Oakley, L. & Pin, A. 2013. “Quiabentia verticillata.” The IUCN Red List of Threatened Species 2013: e.T152502A644121. http://dx.doi.org/10.2305/IUCN.UK.2013-1.RLTS.T152502A644121.en. Downloaded on 24 March 2016. Cultivation and Propagation: Quiabentia verticillata is a low maintenance plant that tolerate considerable neglect and will naturalize, it is drought-tolerant; and suitable for xeriscaping, but their spines are so painful it is difficult to recommend them for home gardens. Easy to cultivate outdoor in dry, sandy or gravely, well-drained soils. May be grown in clay soils as long as drainage is good and soils do not remain wet, it is very adaptable both in acid, neutral and basic (alkaline) soils, but prefers a pH in the range 6 to 7.5. Frost hardiness: They are not cold hardy, but may survived mild frosts if very dry. Traditional uses: The leaves can satisfy the thirst in case of lack of water. Propagation: Propagated by cuttings of segments at any time in the growing season. (Allow cut surface to callus over before planting).